meadowbrook-trading has no other items for sale. 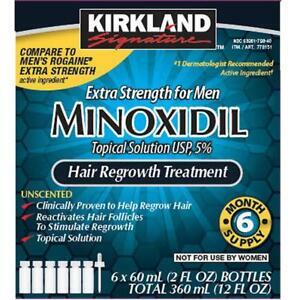 The Kirkland Signature Extra Strength Minoxidil Topical Solution prevents hair loss on the scalp for men. This product shows results in two to four months. It comes with a dropper, which makes application convenient. There are 38 items available. Please enter a number less than or equal to 38. Sales tax may apply when shipping to: CA(9.0%), IA*, MN*, WA*. I can see a slight change in a little over 2 months , but I think it is going to take a much longer to see real results. I think it is worth a try to stick with it for a while longer, at least months or more. Thanks Steven. I've used this product for sometime and sorry to say I've had no success with any type of growth if anything I have less hair than when I started. This product may work for you every one is different sizes good luck if you try it. The product does seem to have filled in a small thinning spot on the top of my head and made my other hair seem thicker. I don't see a lot of new hair however. That being said, if you are completely bald don't expect to be blow-drying a glorious mane anytime soon. Don't expect miracles! For the money, its worth a try, no side effects in my case. UPDATE: Jan-10-2017 1-1/2 month, and I see lots of new tinny hair coming I apply 2 times a day one day off every week."" I've been using it for 3 weeks and I see new thin hair my family genetics are very hairy, it may be different on yours it make take more time. I wanted to fill up some spots where my beard and mustache didn't have enough and now I can see it coming I use it 2 times a day "day and night after shower I dry my face in hot to leave pores open then apply it softly then add cream . It hitches sometimes after it drys I don't scratch or pitch nothing I just leave it alone . But it works amazingly ! !